Few blues records get our full attention here at MetalReviews, but when the band's a side project of Candlemass's Lars Johansson, with support from Therion and Silent Call members, it definitely seems worth checking out. If you can get past the jaw-droppingly stupid name, Fat.Mo.Mac puts on a fantastic performance on their debut album. This is a loving tribute to 70s-style blues that is being paid by a legendary metal guitarist, and it's very hard to go wrong with that combination. There are few light or funky moments on this album, but no doom metal either, of course. Each song is drenched in big, fuzzy riffs with an old-time tube sound, and despite Johansson's Hendrix influences, I was reminded much more of some of the 70s-era British bluesmen such as Eric Clapton and Jimmy Page than of Jimi Hendrix. Mats Levén, a longtime participant in Candlemass, handles vocal duties here with a wildcat squall that sounds absolutely nothing like his usual vocals in the metal world; clearly, he is nothing if not versatile. So Bad It Feels is a good track with a killer bottleneck slide driving the song, but Kickback, an instrumental, displays more of Johansson's soloing skills. Always Like That takes the blues to a walking pace with more slide work, this one more moody and with a grim-but-defeated resignation to the sound that works quite well. Some of these are decent but forgettable songs. Cold Woman has a nice quick-stepping riff to it and plenty of Johansson's pyrotechnics on display, but the melody isn't all that interesting, and the final track, Get Home, had great production but didn't seem like it had much to offer after all the rest. But there are plenty of wins here too. Memories Is All There Is works very well with Levén's voice, and the crisp "chicka" of the riffing combined with the excellent melody makes this one of the better ones, while Gearshifter, a stomping blues march of an instrumental, seems like it, not Get Home, should have been the final track to bring the album to a rousing finish -- Johansson puts all his skills into this one without any distraction and it's quite impressive. 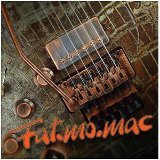 As a side project in a genre that the author's main fan base doesn't follow, Fat.Mo.Mac is quite likely destined for the place all obscure side projects go, but if so, that's too bad. It's a good strong album that evokes the spirit of a decade that had just woken up to the fact that amps could get turned up to bring new possibilities to blues and rock, one that influenced a future generation of metal musicians -- including Johansson.